Oesophageal carcinoma is a malignant tumour of the oesophageal mucosa. The incidence is around 5 to 10 per 100,000 per year, although is rising. The disease is rare below the age of 50 years and tends to present over the age of 60 years. The male to female ratio is 3 to 4 : 1. The incidence of oesophageal carcinoma differs in various countries. The highest incidences are in China, Iran, the Transkei region of South Africa and the southern aspects of the former USSR. The highest incidence is approximately 300 times the lowest. There are two types of primary oesophageal carcinoma, squamous cell carcinoma and adenocarcinoma. The incidence of the latter is around two to three times higher in the United Kingdom. The main risk factor for adenocarcinoma is Barrett's oesophagus. The risk factors for squamous cell carcinoma include the following. Oesophageal adenocarcinoma tends to occur in the lower third of the oesophagus for the simple reason that this tends to be where Barrett's oesophagus is found. Squamous cell carcinoma affects the upper third of the oesophagus is 15%, the middle third in 50% and the lower third in 35%. Other than their risk factors and location within the oesophagus, adenocarcinoma and squamous cell carcinoma tend to share their other pathological properties. As with other tumours of hollow organs, oesophageal carcinoma can present as am irregular, polypoid tumour that protrudes into the lumen, or as a sessile, possibly stricturing, lesion, the latter being more frequent. Surface ulceration is common. The wall of the oesophagus can become infiltrated and stiffened by the carcinoma. Local invasion is into the organs of the mediastinum, such as the bronchi, trachea, lung and pericardium. Tumours in the upper part of the oesophagus can invade structures within the neck and this will rarely include the carotid arteries or the laryngeal nerves. Metastases first affect the local lymph nodes then spread to the liver, lung and brain. Oesophageal carcinoma is staged by the TNM system. Stage T4 can be subdivided into T4a (the tumour invades the pleura, pericardium or diaphgram) and pT4b (the tumour invades the trachea, aorta or vertebral column). Stage T4a tumours are theoretically surgically resectable whereas stage 4b are not. The cut up of an oesophagectomy specimen follows the basic principles of the cut up of a hollow organ and is simliar to the method employed for a rectal tumour. The main differences from a rectal tumour are that a high tie lymph node is not present and that it is often prudent to leave the entire specimen closed and instead to divide it all into serial transverse slices. The entire circumferential surface of the specimen is a surgical margin and therefore inking it is prudent. The main symptoms are dysphagia and odynophagia. The dysphagia becomes increasingly worse and although only the swallowing of solid food is impaired initially, the dysphagia progresses to affect the swallowing of liquids as well. The difficulty in swallowing can cause weight loss. Weight loss and anorexia are also general, non-specific symptoms of many malignant tumours. Anaemia can arise due to chronic blood loss from the tumour, although haematemesis is unusual. The carcinoma can cause chest or back pain. Rarely, the voice can become hoarse if the tumour infiltrates the recurrent laryngeal nerve. Invasion of the trachea or bronchi may cause a cough; if the invasion is associated with the formation of a fistula then aspiration pneumonia will develop. Invasion of the pericardium / left atrium can induce atrial fibrillation or pericardial effusion. 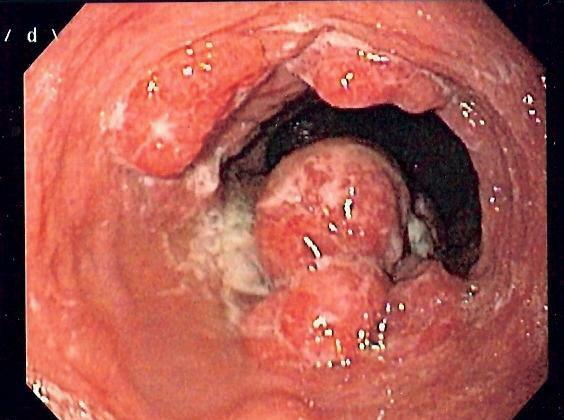 The main diagnostic investigation is an upper GI endoscopy with a biopsy of the tumour. A barium swallow may sometimes be performed as the initial investigation of dysphagia and this can show the tumour mass. A CT or MRI of the chest can demostrate the tumour and indicate its radiological stage. This can be crucial in determining if surgery is a feasible option. Standard blood tests (FBC, U+E, LFT) are usually performed to evaluate the nutritional and metabolic consequences of the tumour. Oesophageal carcinoma tends to present at a late stage and thus less than one third of patients are suitable for surgery, particularly as there is considerable morbidity and mortality from the procedure. Anatomical continuity of the gastrointestinal tract is restored either by mobilising the stomach into the thorax or converting a segment of colon into a replacement oesophagus. 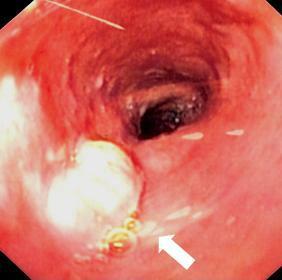 Very early carcinomas may be amenable to endoscopic mucosal resection. The majority of patients are suitable only for palliative therapy which may involve chemotherapy and/or radiotherapy. Strictures can be held open by stents. The overall five year survival for oesophageal carcinoma is around 5%, largely due to the late presentation and paucity of patients who are suitable for surgery. Oeosophageal tumours are dominanted by adenocarcinoma and squamous cell carcinoma. However, other types of primary neoplasm can be encountered in the oesophagus, such as small cell carcinoma, gastrointestinal stromal tumours, leiomyomas and granular cell tumours.